Recipe To Be FIT: Are all Beachbody Coaches the same?? Are all Beachbody Coaches the same?? This is a question among many others that come up often so I figured I would blog about it. Are all Beachbody coaches the same?? NO! We are all different in that we have different stories, different journeys we took to where we are today, different backgrounds, and different things that motivate us to be a Beachbody coach. Do I have to be in the best shape to be a Beachbody coach?? NO! Coaches can just be starting on their weight loss/healthy journey, in the middle, or at the stage of maintaining. Coaching is about having a love and belief in the products and sharing that with others. Being a "product of the product" is one of the vital behaviors Beachbody coaches do. We do not sell. We are not marketers trying to convince you to buy something we do not believe in. We use the products, trust the products, thus we promote them to those who are interested! 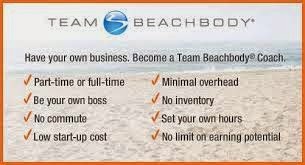 If I am a Beachbody coach, do I have to build a business around it?? NO! Level 1: I want to sign up purely for the 25% discount on all products. I want to be the FIRST to know about new products. I want to be able to get products FIRST! Level 2: I want to grow a small business out of it. Earn a small monthly income to pay off loans, help with the mortgage, be able to have "fun" spending money, etc. Level 3: I want to make this my full time job. I want to earn enough through Beachbody coaching to work from home all the time. I want to be able to build my own team, build coaches underneath me, so that my team makes an impact on others! Do I personally even need a Beachbody coach?? YES! Will I have support when first starting out as a Beachbody Coach?? YES! One of the best parts about being a coach is that we are all in it together. We all want to end the trend to obesity, help others eat healthier, live happier lives. We have personal motivations as well, but you will never be on your own. You will be placed in online coach apprenticeship groups, go through some online training, as well as always having your own personal beachbody coach give you assistance along the way! If you are interested in becoming a Beachbody coach, or want to hear more of what it is all about...Email me at Lynng258@gmail.com and we can connect on what your goals are! NEW YEAR, NEW YOU!! January Sales! !